In Hip Abrasion Arthroplasty no prosthetics are attached permanently to the end of the bones. Rather the end of the bones (femur and sacrum) are removed with a burr to the depth of about 1 mm. In an attempt to heal themselves, the bones slowly exude a substance, which will eventually replace the lost cartilage. Although this material is a bit harder than the original cartilage, it works quite well. Unlike arthroscopic knee and shoulder surgery, hip arthroscopy with stem cell treatment has seen advances only in the last few years thanks to the development of new surgical instrumentation. With the hip joint surrounded by a thick wall of soft tissue, mostly muscle, the joint space cannot be reached as easily as in the knee or the shoulder. Liquid is also used when operating on the hip to facilitate the use of motor-driven instruments on the synovium, cartilage and bone. On completion of surgery, the tiny portals are closed with steri strips. In the majority of cases the patient is pain-free after surgery and very often the pain previously experienced is gone instantly. A patient being treated for arthritis of the hip must use crutches for 2 to 3 months to allow the replacement cartilage to grow out and mature. This technique, known as "abrasion arthroplasty", has been used with great success for more than 20 years. So far over 5,000 such knee operations have been performed for severe osteoarthritis. To the right is a picture of the surface of the femur before >Hip Abrasion Arthroplasty. Here one can see the damage that bone lesions and arthritis cause to the bone. This damage excellerates the deterioration of the cartiledge. The next picture to the right shows the surface of the femur after Hip Abrasion Arthroplasty. Please notice the smooth surface. It takes six to eight weeks of walking on crutches and not applying the full weight of the patient on the bone to fully regenerate to this state. 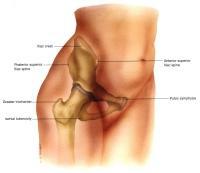 The stay in the clinic for Hip Abrasion Arthroplasty is usually two days with a three day stay in a hotel. Light amounts of therapeutic rehabilitation is necessary for a full recovery.